The effects are felt by the rider and the trainer after 7 days of supplementation. 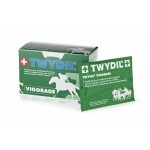 For the majority of horses maximum effect will be achieved after 10 days. Combination with TWYDIL® HIPPACAN+C is recommended in preparation for a competition. 10 vitamins, 7 trace elements, Extracts of Ananas comosus and prebiotics. Officially certified by LCH can be used without risk.